Now, I know that it’s quite hard to digest if you are new in the cloud computing business. So, for an easier way to describe cloud computing, let’s define it as a software that acts as storage and runs programs by using someone else’s computers that are built on several servers connected through the internet. Some people gets confused about how storage and running programs are possible without a physical server in sight. But cloud computing is best understood by thinking of the internet as a lengthy and limitless network switch that can reach computers all over the world that act as servers. They are all connected thru this switch, and they provide quality service for end users when accessed through the internet. Cloud computing services are now offered for businesses as the demands for online presence rises. Every service works differently from one another, but many share the features of a user-friendly, browser-based dashboard that you can easily manage, while some even offer multiple options for the developer. In fact, it would be better if you can have IT professionals and developers to be part of your team to ensure the efficiency of ordering resources and managing accounts. What is Cloud Computing for a Regular End User? What is cloud computing in the most common knowledge of non-tech people? You can see how cloud computing works when you access apps from the web browser, like Firefox or Google Chrome. These apps allow users to save their work online and retrieve them even if they transfer from one endpoint to another, provided that there is an Internet connection. You can access the file through a laptop, then access it later thru your phone. Cloud computing makes such accessibility possible. Samples of this application is Dropbox and Google Drive and its office apps like Google Docs, Google Sheets, and Google Slides. You can even work with someone else on the same document, or one would be viewing the changes you are making at the very moment. That sums up what is cloud computing for a regular end user. But what is Cloud computing for businesses is a little different. Let’s see how. What is Cloud Computing for Businesses? What is cloud computing in businesses doesn’t have a lot of difference? It would still be about storage, running applications, accessibility and sharing of computer resources. Since websites of businesses use services for their online presence, cloud computing provides service on demand, which means, business get to pay only the resources that they use. This scalability is tempting for a lot of Small and Medium Businesses who needs services for a cheaper price. This leads to our next point of discussion: what is cloud computing for the Small and Medium Businesses? What is Cloud Computing for Small and Medium Businesses? As businesses take a slice of the virtual space for their existence, the onset and continuous move into the internet for sales made cloud computing an interesting option for entrepreneurs. 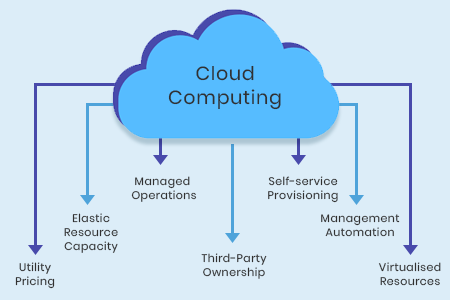 Before we discuss what is cloud computing, let’s try to understand the need that brought forth the use of cloud computing, not just for personal use, but more importantly, for business ventures. The complexity and expense brought by the traditional business applications for network management opened the demand for another option. Imagine the amount and variety of hardware and software that you need just to run a business and keep it secured. You need an entire team of experts, not just any tech guy, to install, configure, test, run, secure, and update your network as you hold things together for your business to run at its top performance. If you multiply all these tasks to hundreds of applications that your network needs to run, you will need an entire department to ensure the quality of service your system gets. Big businesses have IT departments to take care of those demands. But what about Small and Medium Businesses? Since Small and Medium Businesses do not earn as much as the big players in the industry, IT management rarely becomes a priority. What is cloud computing for these Small and Medium Businesses? Cloud computing became the equalizer that provided opportunities for small players to access affordable network management services. Suddenly, the paradigm shifts when businesses realized what is cloud computing and how it can be maximized to fuel their e-commerce feat. Now, smaller organizations have access to processing power, storage and business processes that used to be limited for the large enterprise.